Will a Metal Roof Lose its Color? One of the biggest concerns metal roofing industry customers have is about paint fading. Acknowledging that all paint systems will fade over time, it’s important to understand fading and how painted metal warranties account for it so you can select a paint system and warranty that provide maximum protection. Buying a red roof that prematurely fades to pink is unfortunate enough, but this is made even worse by a warranty that doesn’t adequately protect your purchase. Why does paint fading matter? The paint on your metal roof or wall isn’t just for decoration. In addition to providing color, the paint finish also protects your panels from corrosion, temperature, moisture and other detrimental environmental elements. Fading is the most common source of color change over time and happens when environmental elements deteriorate the paint’s pigment (granular particles that give the paint its color). This deterioration also reduces the paint’s effectiveness in protecting metal panels. Paint fading is measured by the American Society of Testing Materials’ (ASTM’s) Hunter unit (∆E) standard, which compares the faded color to the original. In accordance with ASTM Standard D2244, one Hunter Unit is equal to the smallest amount of change visible to the naked eye. What do you need to look for in your warranty? Selecting a product with a 40-year warranty is a great start, but because not all panels, paint systems and warranties are created equal, you should ensure that the manufacturer of your product provides a warranty that clearly defines the number of Hunter units the paint system is allowed to change for both vertical (wall) and horizontal (roof) applications. This is critical when comparing one painted metal roof or wall against another. The lower the number of Hunter Units expressed in the warranty, the better the paint system will resist fading. ABC’s Premium paint system warranty guarantees paint will not fade in excess of five units in vertical applications and seven units for non-vertical applications over the course of 30 years, with the exception of Radiant Red. 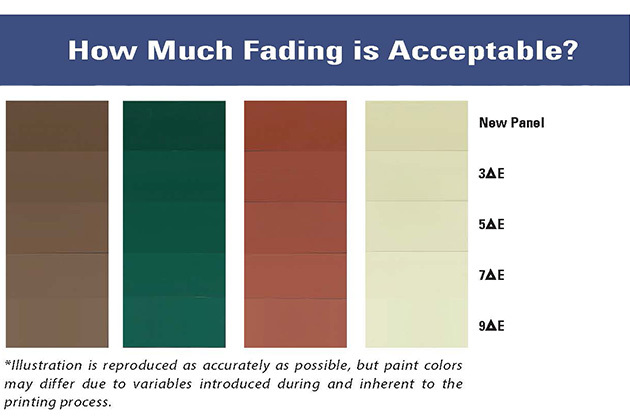 ABC’s fading specification on all colors available in our Select 40 paint system guarantees protection for the same degree of fade as guaranteed in the Premium system, but for 25 years. Check out ABC’s color resources and warranty information to learn more! Understanding the film integrity and fading for metal panels is very important, but it doesn’t end there. In the final installment of our “Decoding Your Warranty” blog, we will uncover a third consideration in understanding metal roofing and siding warranties: chalking.